The High Line, the beautiful elevated park meandering through Chelsea is attracting crowds of strollers clearly enjoying this unusual city oasis. There is a side story quietly unfolding because of this park involving the artist Hyemi Cho whose apartment faces the High Line between 27th and 28th streets. Here is her story. Then I imagined myself cautiously peeking through my curtain looking outside, seeking the sky and river I used to love to see. I thought, “I am a painter. Why don’t I paint the reality of life and put it out to the public.” In this way, I would (re)solve the restriction of my freedom and my frustration of this invasion of my privacy. The window paintings have brought me, now an animal in a zoo, delightful interactions with people on the High Line. Everyday, I see people laughing at the paintings and photographing them. 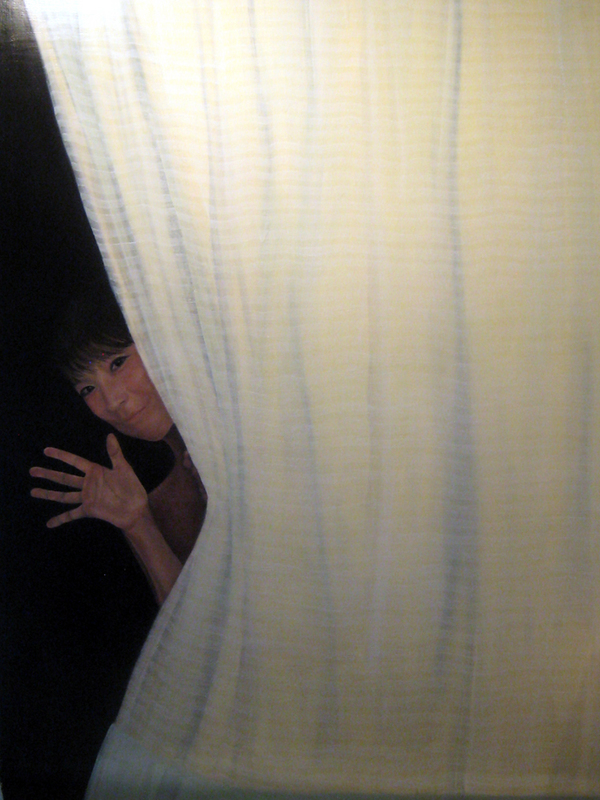 Sometimes, I actually peek out and wave my hand, the real life recreation of the painting. The surprise on their faces turns to excitement and they wave back, saying “hi” with their hands. I see that my paintings are a good surprise and make people smile and laugh.